There are a lot of gantt chart Excel templates out there. So how do you know which one is the best? I’m glad you asked! 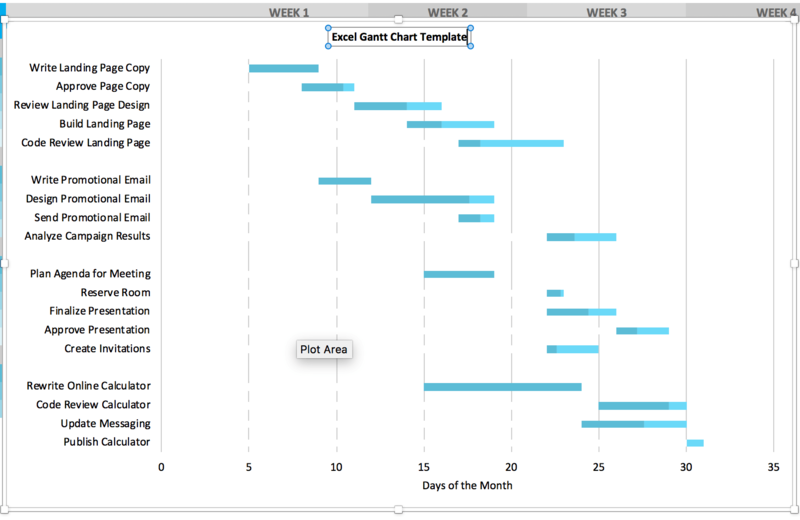 We’ve done the heavy lifting for you and created a brand-new gantt chart Excel template you can download now for free! 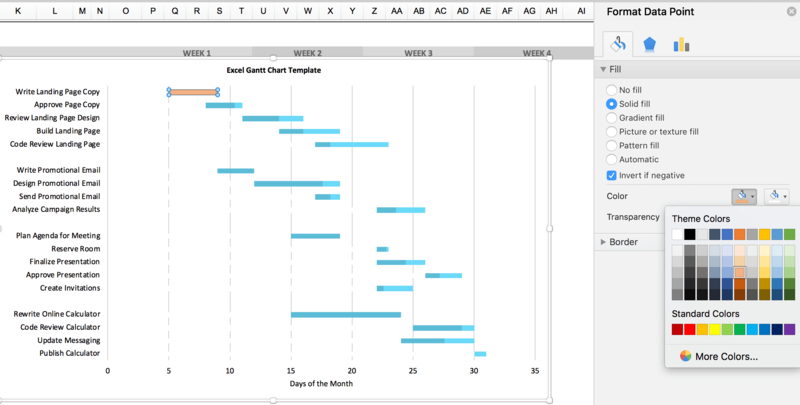 The gantt chart is compatible with Excel versions 2000 and up on Mac and Windows. Using our premade Excel gantt chart schedule template can save you tons of time by organizing your project plan and tackling the tedious planning work for you! All you need to do is plug in your tasks and the dates, and you'll have a presentation-quality Excel gantt chart. Want to learn how to get started? First, download the template, then read on or watch the video above. We’ve made this gantt chart template as easy, powerful, and painless to use as possible for managing your projects. 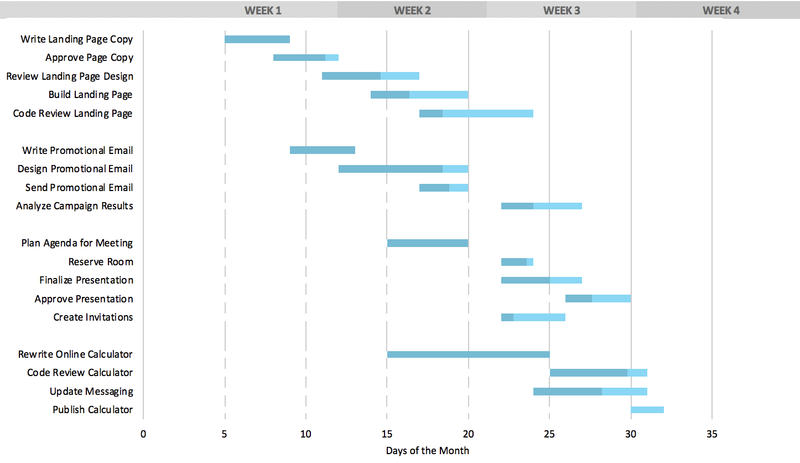 This gantt chart can be used for anything from construction projects to website redesigns and beyond. 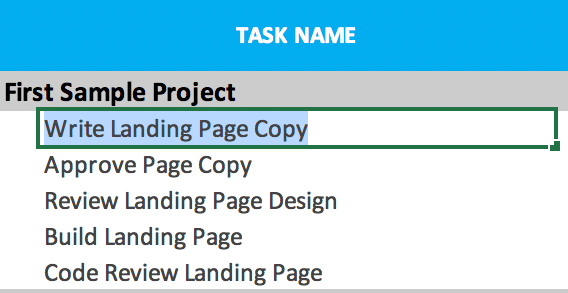 The template is already set up and ready for you to start plugging in your project’s tasks. Below, you'll find details on how to set up each task, assign task dates and team members, automate task durations and timeframes, and track task progress. That should cover the basics for most projects. But if you need to add more, it’s really easy to customize the template. First, rename existing tasks to fit your own project. We’ve set up some example tasks as a default. Just click on any cell in "Task Name" column and rename it. 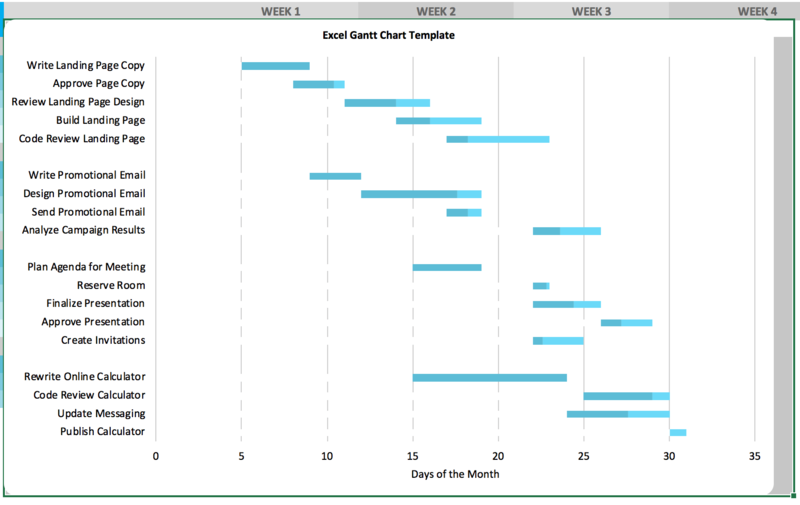 Next, update your task start and end dates within the Excel gantt chart schedule template. These cells are pre-formatted as date cells in the standard US format. However, you can change that format to fit your preference or location. 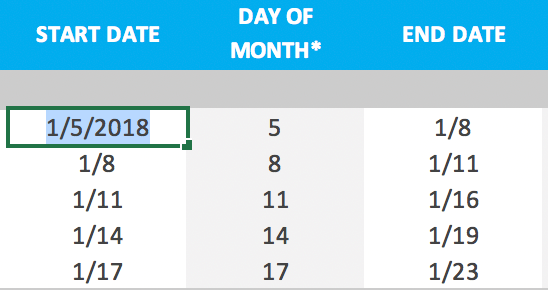 The Day of Month column populates automatically based on the start date you enter. The Duration column for each task is automatically calculated within the gantt chart template by subtracting the start date from the end date. As you enter your start and end dates, the Duration column will populate on its own. Duration shows in days by default. Finally, enter the team member assigned to each task, and update the Percent Complete column. You’ll see the cell color deepen as a task nears completion. The Days Complete and Days Remaining columns are automatically calculated based on the task’s duration and percent complete. You’ve now created a basic gantt chart. But if you’re like us, you don’t go for basic. Now let's talk about how to make your chart stand out. You know what your project is all about. Make sure everyone else does, too! 1. 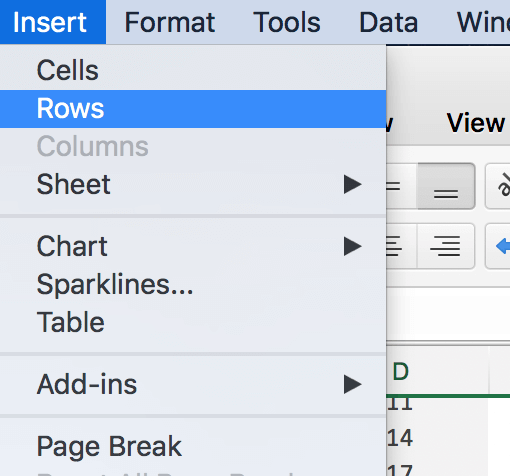 To add a title to your chart, highlight the chart, and then click Chart Design at the top of the Excel menu. 2. Then click Add Chart Element > Chart Title > Above Chart. You can color-code tasks by team member or the type of work being done. Here’s how to change taskbar colors on your gantt chart. 1. Click on a single bar twice. Be careful not to double-click it. 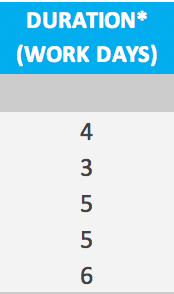 Instead, click it once to highlight all of the bars in the gantt chart, and then click it again to highlight just the taskbar you’d like to change. Then, right-click that bar, and select Format Data Point. 2. Select the paint bucket, and choose a color for the taskbar. Repeat for any other taskbar you want to change. Projects come in all shapes and sizes. 1. Highlight the last filled row in the chart, and click Insert > Rows. 2. A row with the same formatting and formulas for calculating the day of the month, task duration, and days complete and remaining as the other taskbars will be added just above the selected row. Some people still use paper, right? 1. To print just the gantt chart, you first need to set a print area. Click in a cell behind one of the corners of the gantt chart, and drag out a selection that covers the entire chart. 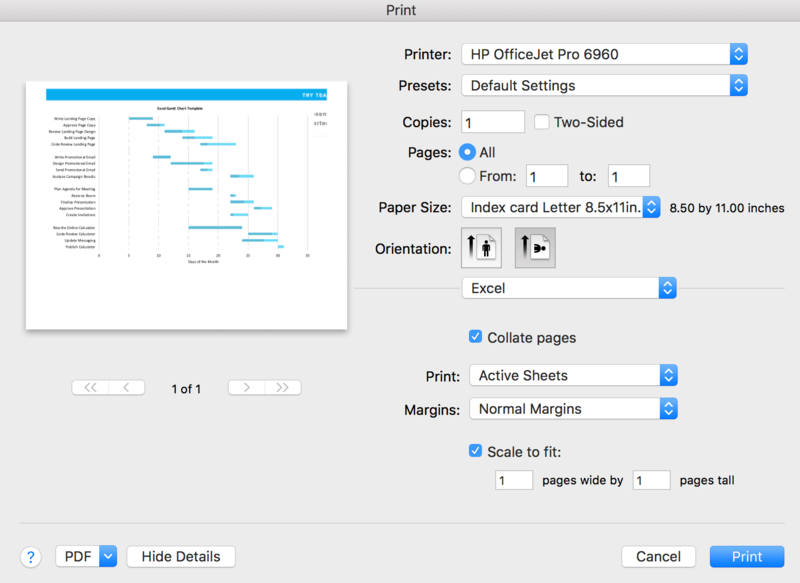 Then go up to File > Print Area > Set Print Area. 2. Now that the print area is set, go back to File > Print. Depending on the size of your chart, you’ll probably need to either adjust the scale of the chart to fit on a single page or have the chart span multiple pages and manually tape them together to make one big printout. 3. To print the entire workbook, including the gantt chart, just go up to File > Print. Again, depending on the size of your chart, you’ll probably need to either adjust the scale of the chart to fit on a single page or have the chart span multiple pages and manually tape them together to make one big printout. Want an easier way to build gantt charts? 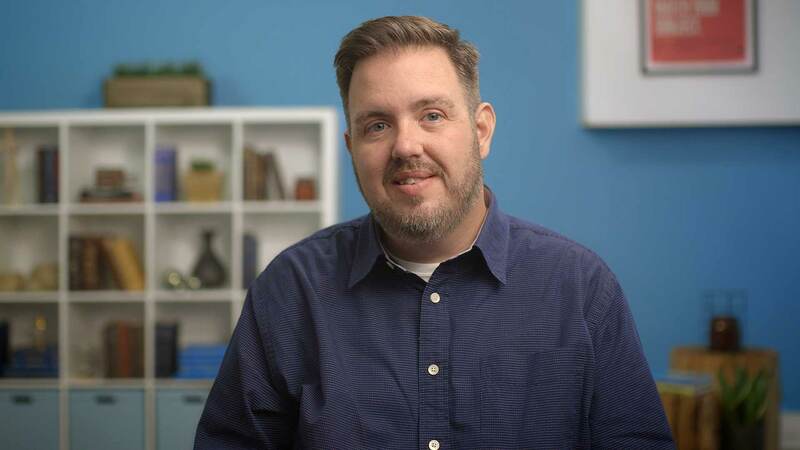 Creating gantt charts that are simple, beautiful, and super-easy to manage and update is exactly what TeamGantt was designed from the ground up to do. Forget having to keep track of multiple Excel files for each project and wasting time making sure all your charts are presentation-ready. TeamGantt makes it easy—and dare we say FUN—to create and manage your projects with shareable gantt charts. 1. Go to teamgantt.com/signup to sign up for your free account to get started. 2. Once you log in, go to My Projects in the sidebar, and click + New Project, then Create New Project. 3. 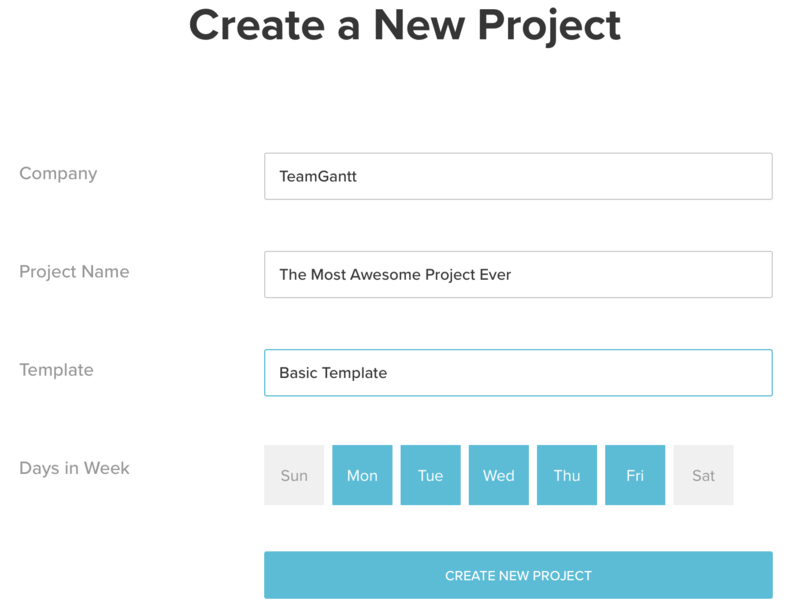 Give your project a name, and choose a template to get you started if you want. Choose the days of the week you want to be able to schedule work in your project, and click Create New Project. 4. Your project is created, and you’re ready to start adding your tasks! 5. Once you’ve added your tasks to the task list, just click and drag each taskbar to set the dates and duration. 6. If you have tasks that can’t begin until another task is complete, you can add a dependency to make sure those tasks are always done in the proper order. Simply click the gray dot to the right of the first task, and drag the dependency to the dependent task. You’re all done! Congratulations on creating your first project in TeamGantt! You can create a beautiful project plan in just minutes with TeamGantt. And because everything happens online, it's easy to track project progress and collaborate with your team in real time.